Hedges are great. Ideal as markers, cover or edges on the battlefield. Now, I don't mean privet or box or anything lightweight like that. I mean a proper hedge. Hawthorn, or better yet, blackthorn. These hedges, if they are carefully maintained and trimmed, every few years, can be "laid". 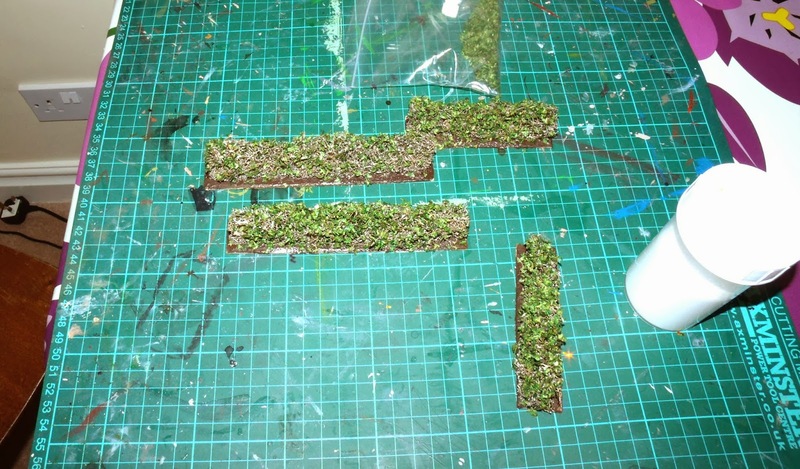 This is a process where thicker vertical stems are cut partway through, then pushed over at an angle to provide an interlocking wall of growth, going horizontal and vertical. Basically, you can't force your way through a well-laid hedge with anything much smaller than a decent sized tractor. And climbing over it isn't recommended either. The thorns will cut you to ribbons (with the added attraction that if it's blackthorn, the cuts inevitably seem to fester - yuck!). It's like a barbed wire entanglement - just more attractive to wildlife and much nicer to look at! There seems to be evidence of deliberate hedging and hedge laying in the British Isles going back to the Bronze Age, so a set of hedges is a useful addition to a battlefield in any era. Over that time, different styles have devloped, in response to different requirements (to mark a boundary, or retain sheep as opposed to cattle for instance) and variations in climate. So it is possible you could get a hedging expert who will tell you your Yorkshire-style hedge has no place on a southern battlefield, but I'm prepared to take the risk! Then added a thin coat of caulk to give some semblance of unevenness. 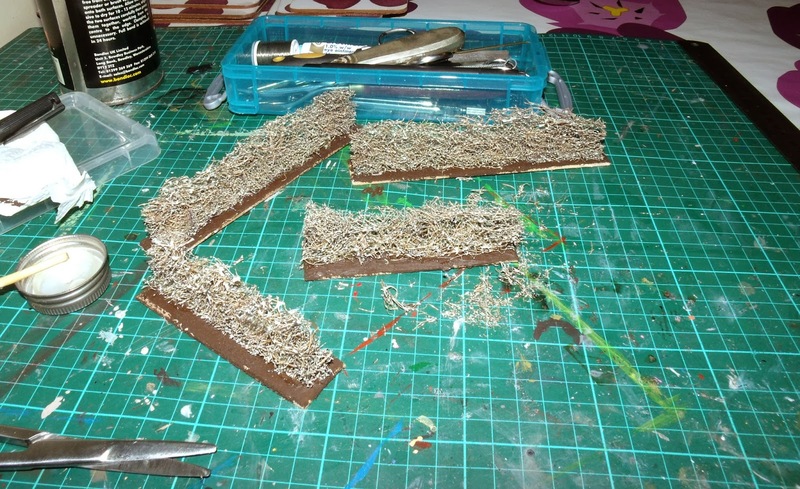 And gave them a coat of brown emulsion mixed with sand and PVA. This is a block of rubberized horsehair (from the nice chaps at Treemendus), to form the body of the hedge sections. The next thing is to cut the horsehair to size. Having tried (very sharp) scissors and (ditto) scalpels of varying sizes, I can't really decide what's the best tool for this. They all seem to struggle! 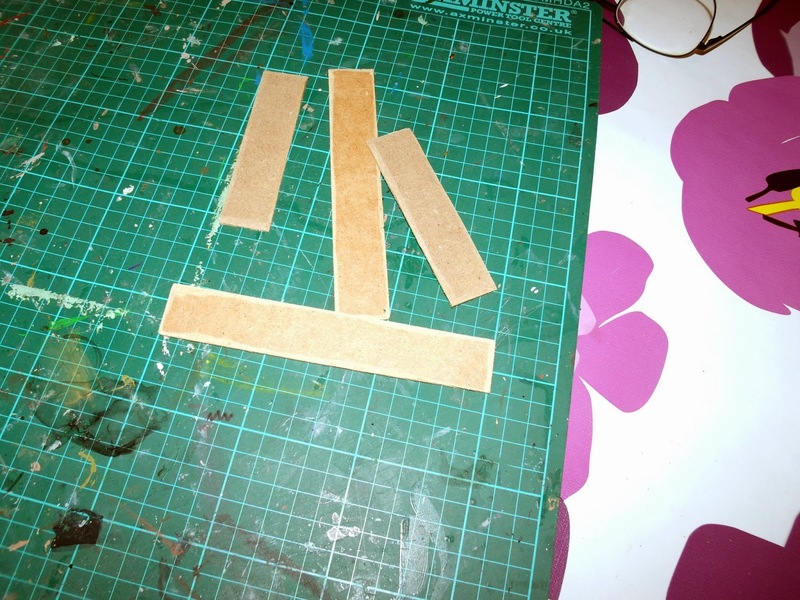 Anyway, strips need to be about 20-25mm high by 10-12mm thick. A hedge this size is proof against most things except tanks. You can leave the top flattish, or straggly and tapered, depending on how well-maintained you want the hedge to look. Glue the horsehair down. I use impact adhesive. In theory, you could use them like this for winter-set games. Bare and cold-looking - Brrr! 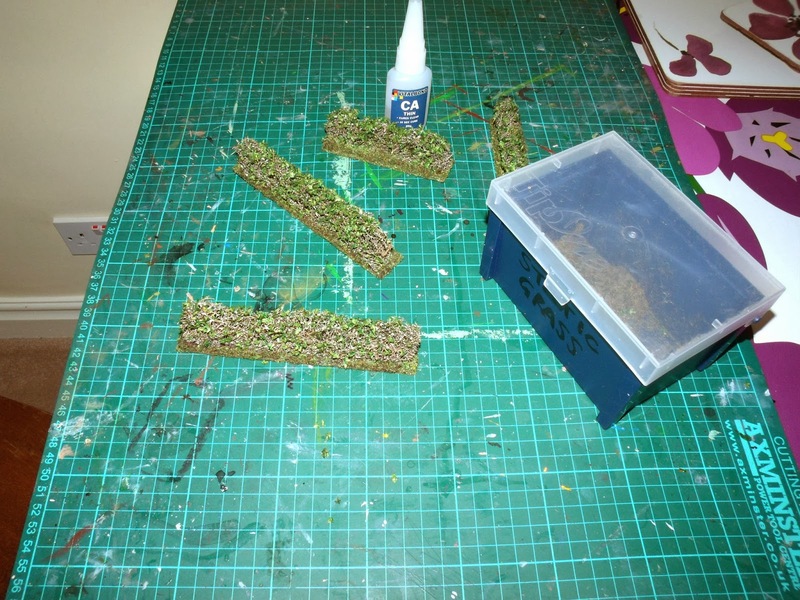 Once all is dry, give the hedge a spray with diluted PVA glue from an atomiser bottle. If you don't have one, get one. Three bits of advice: firstly, clean it out carefully after use as any glue in the nozzle will block it; secondly, don't pinch it from your daughter or wife as this may dramatically reduce your life expectancy, thirdly, filter what you spray through it - this will extend the life of your atomiser. 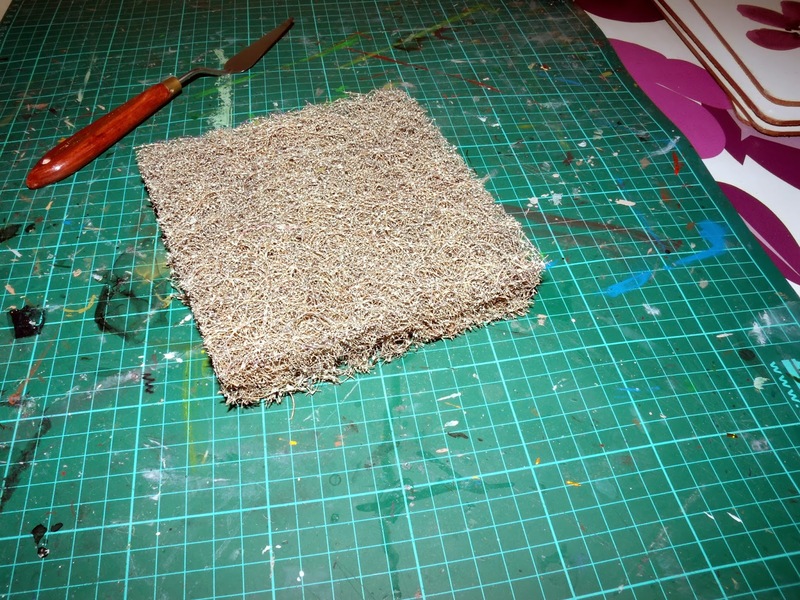 Sprinkle with an appropriate hedgerow mix (mine comes from Treemendus, and I think is better that other brands I've tried) and allow to dry. Once dry, I repeated the process on two of the sections, to give a sense that some bits of the hedge are desner than others (as per reality!). 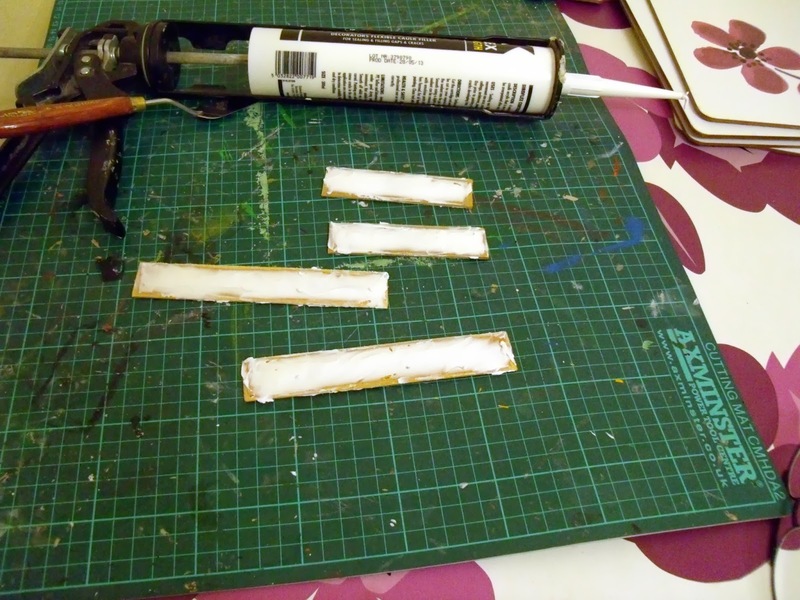 Finally, I gave them another coat of dilute PVA to seal everything in, and allowed them to dry again. All covered in foliage - feeling warmer already! 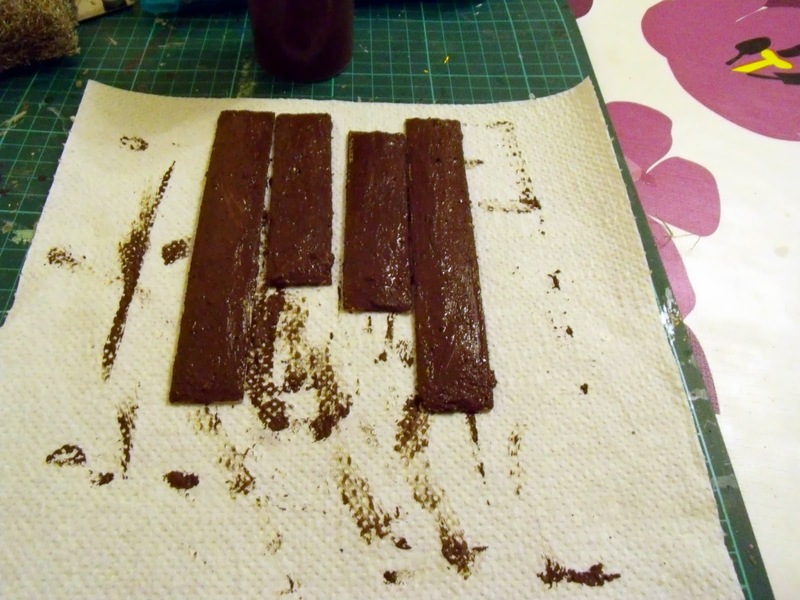 Carry out your normal approach to groundwork on the bases, and varnish to taste. My experience is that these hedge sections are significantly less robust than fencing, and so benefit from being stored carefully - i.e. not under a Sub-Roman church! Here they are, in use. First with some Saxons carefully picking a way through. Carefully because you never know what might be the other side. 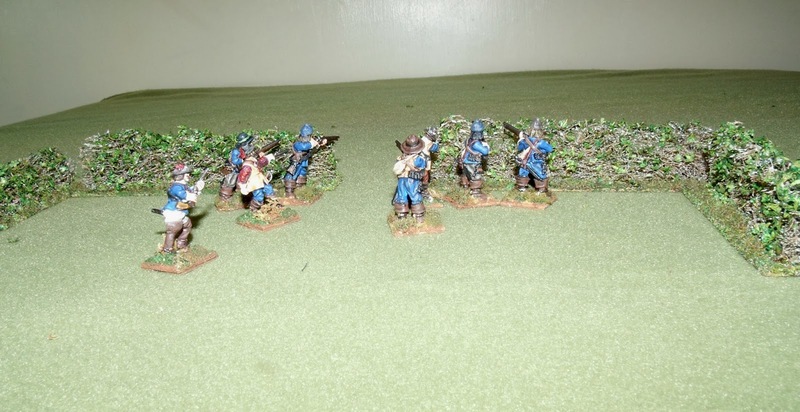 And here, with my ECW dragoons. The native environment of dragoons is, of course, lurking in place like this to make life uncomfortable for other people. This, therefore is a good test of the suitability of the hedge sections!